The high-temperature oxidation behavior of a new family of refractory high-entropy alloys (HEAs) with compositions of W–Mo–Cr–Ti–Al, Nb–Mo–Cr–Ti–Al and Ta–Mo–Cr–Ti–Al was studied at 1000 and 1100 °C. Based on these equimolar starting compositions, the main incentive of this study was to select the most promising alloy system whose properties may then be successively improved. Despite the high amount of refractory elements, Ta–Mo–Cr–Ti–Al showed good oxidation resistance at 1000 and 1100 °C. Moderate values of mass gain and complex oxidation kinetics were observed for the W- and Nb-containing HEAs. These alloys formed inhomogeneous oxide scales possessing regions with thick and porous layers as well as areas revealing quite thin oxide scales due to the formation of discontinuous Cr- and Al-rich scales. The most promising behavior was shown by the alloy Ta–Mo–Cr–Ti–Al which followed the parabolic rate law for oxide growth due to the formation of a thin and compact Al-rich layer. The financial support by Deutsche Forschungsgemeinschaft (DFG) is gratefully acknowledged. 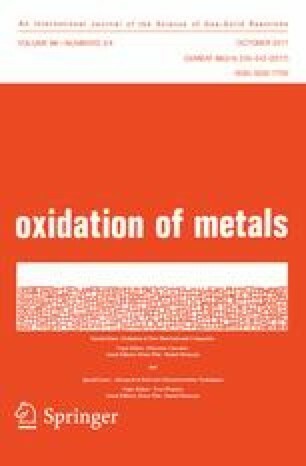 N. M. Geyer, Protection of Refractory Metals Against Atmospheric Environments, http://contrails.iit.edu/DigitalCollection/1961/ASDTR61-322article07.pdf. Assessed 1 March 2016.